Need some high-end hardware to help up your game? You're in luck, as we've teamed up with CM Storm to give three lucky readers the chance of winning a Trigger keyboard, a Sentinel Advance II mouse, a Sirus headset and a Speed RX Large mousepad! 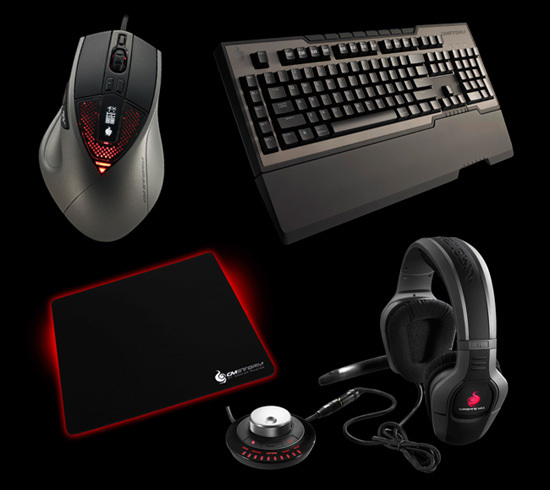 With this high-end CM Storm gaming gear package, you are ready to beat all of your friends! The Trigger keyboard is a fully back lighted mechanical keyboard which should give you an important advantage while gaming. The Sirus headset (including soundcard) allows you to customize your sound settings for an optimal performance. Together with the Sentinel Advance II with its 8200DPI laser sensor, this package contains everything a gamer could wish for! No more excuses when you lose, because with these CM Storm prizes you are always one step ahead! Thanks again for another great competition. hint: the answers cooler maestro. “ Europe Only” error. Is this something new or Croatia ain't there?